Since the release of the first Harry Potter book ‘The Philosopher’s Stone’ in 1997 (20 years ago, can you believe that?) The fictional world of Harry Potter has provided never ending magical experiences. From the books to the films, the musical to theme parks and studios. 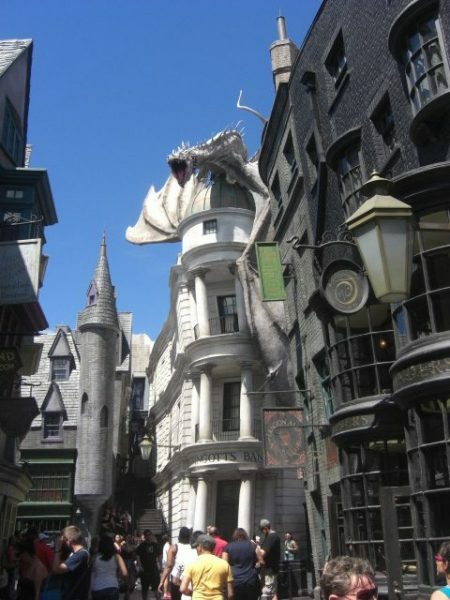 I’ve been lucky enough to visit both Universal Studios in Florida and the Harry Potter studios in London. Both of which provide an amazing experience and really do make a Potter fan’s dream become a reality. At Universal Studios, the attention to detail is insane. The rides are amazing and you even get to ride the Hogwarts Express between the 2 theme parks (Universal and Islands Of Adventure) – providing that you’ve bought a 2 park pass. Speaking of Universal Studios, they had a Harry Potter Celebration just the other day where they had some of the cast from the film. Pottermore were there too, talking about the exciting new updates on their site. Not only that, but Warner Brothers announced that the studio in London have a brand new exhibit and expansion modelled after The Forbidden Forest. How exciting is this? I went to the studios in 2013 and there have been a fair few additions since I went. After hearing the announcement and seeing this amazing trailer, I really want to go again. The studios have already given us a brief idea of what to expect. The newest addition to the studios is a model of Buckbeak which you’ll be able to bow to (need to do this!) You’ll also get to see Aragog which they must have moved from one part of the studios to the forest. I saw this when I went and it is absolutely massive. Here are 5 things that I would like to see in the Forbidden Forest. I’ve heard that the studios in London always change the themes depending on the time of year. So if it’s Halloween they’ll decorate it accordingly. During the winter, Hogwarts will be covered in snow. How cool would it be to have different weather conditions within the forest? Wind, rain, snow, fog, sun – you get the idea. I wonder if there’ll be a day and night time one too? I think this will add that extra bit to the experience. Ok, I know this one might be a bit far fetched but we could dream. I know that there’ll be the actual costume there, lantern in hand from the film which is pretty cool in itself. Don’t suppose someone fancies dressing up like Hagrid to give visitors the full effect? Just an idea. Obviously, if I’m going to be risking getting into trouble with Dumbledore by going into the Forbidden Forest – I want a legitimate backup plan should we get caught. So while I’m there, can I have a lesson in ‘care of magical creatures’? I may as well learn something when I’m there because I’m a good student of course. We already know that we’ll get to see Buckbeak and Aragog, but I do hope that there’ll be some Centaurs dotted around here and there. I know that the stone was pressed into the ground by one of the centaurs and it got buried pretty deep. Do you reckon people could have a go at digging it up? If not, I would love to see it! The expansion is due to open on March 31st which will be the 5th anniversary of the opening of the studios. Before then, we will probably have more of an idea what we can expect by checking updates on the hashtag #FollowTheSpiders. Buy your tickets here.